Congrats Santanu on great achievement.Thanks for sharing us very useful info. Congratulations. I will absolutely be using your website during my path to becoming an architect is several areas of Salesforce. Again, great job on passing these exams. 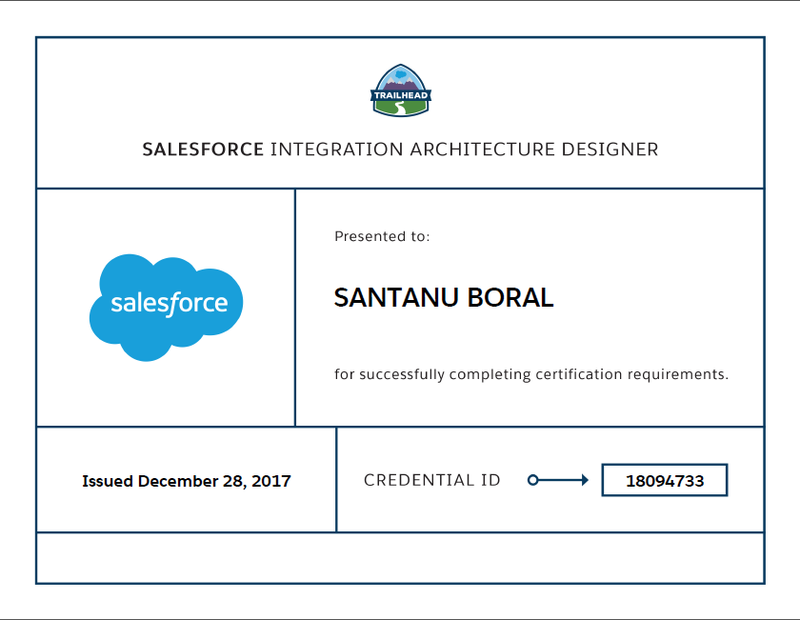 Hi Santanu...Thank you for providing excellent guidance on your blog for passing Salesforce Certified Integration Architecture Designer. This is really helpful !!! Hey documentation says "You can't create outbound messages for workflow rules on junction objects." but your blog post is misleading, Can you correct it? You can go to resource guide and click on "Integrating with Outbound Messaging" tutorial and then go to the knowledge check. It clearly says, Outbound messaging can include Junction objects to send the data. Very interactive blog to read and share it further. Thank you for sharing such useful information with us about Salesforce. I believe Sales Force Consulting helps a lot in such cases. I would like to hear from you in the future as well. Santanu - thanks for sharing this. I have made your blog part of my study material for architecture exams. I recently passed the Integration Architecture exam and read through your site after going through all the trailhead resources. Very helpful. Good luck on your journey to CTA.